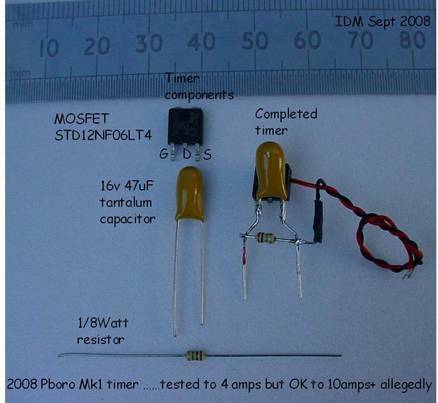 The following notes describe the construction of a very simple electronic timer for indoor free flight made from 3 major components, a FET (Field Effect Transistor), a resistor and a capacitor. This thread guides the interested, hesitant newcomer through the culture shock of an electronic discipline which many find tricky to get to terms with. ..worry ye not, this is not as difficult as you think!! If you apply a voltage to the Gate (G) of a FET, the Source/Drain (S/D) pins will conduct. If you put a battery and motor in this circuit , it will switch on. 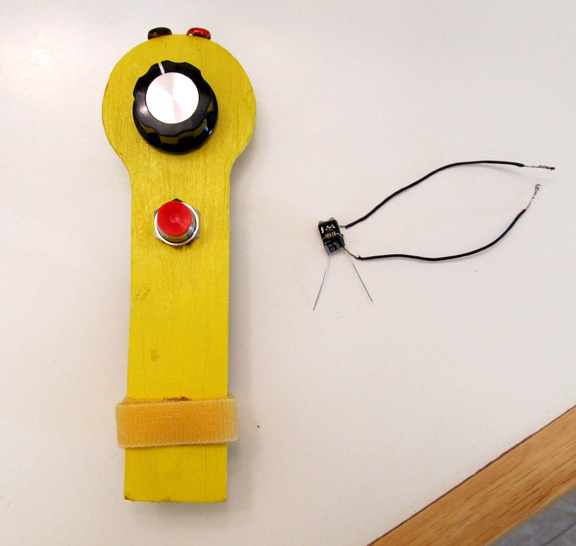 You get the voltage on (G) by charging or 'zapping' the capacitor with an external battery. The resistor gradually drains the capacitor until the (G) voltage dissipates. The (S/D) resistance increases and the motor switches off. By varying the magnitude of the voltage applied to the capacitor, you can vary the motor run time. Refer to the MK1_timer graphic. Solder the capacitor and resistor to the (G) and (S) pins of the FET. The capacitor is polarised and must go brown stripe (or positive) to (G). The resistor doesn't care which way around it goes. Solder a red wire to the (D) pin (on the back of the FET) and a black wire to the(S) pin. A 10-15 Watt iron with a 1mm tip makes things easy. Maplins are a good source but check the tip before you buy and treat yourself to the finest tip you can find. 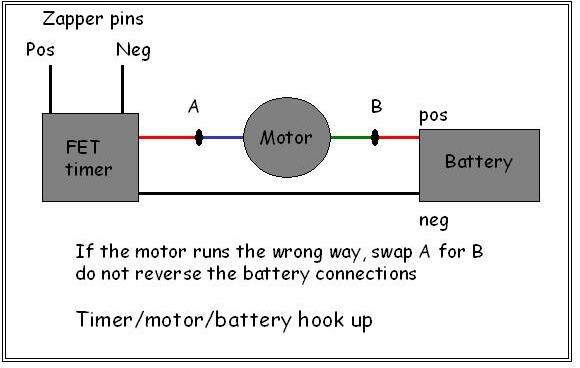 Refer to the 'FET_motor_hookup' graphic. Access the 'connectors' thread on FlyQuiet (http://www.flyquiet.co.uk/smf/index.php?topic=1332.0) and use a non polarised type 4 set up on the motor and polarised type 6 on the battery. 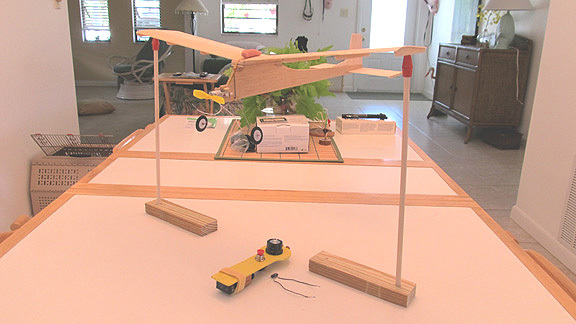 On the first set up, the wise man builds a test rig to become familiar with the use and operation of the timer. If you doubt your ability to specify motor/battery/prop then tell me what you want to do and I can advise accordingly for both indoor and light outdoor FF stuff. Capacitance in uF x Resistance in Mega ohms x 1.5 = motor run in seconds. 33uF x 2.2 x 1.5 = 109.0 seconds, (although longer runs are harder to predict accurately). If anyone else has run similar tests we would be pleased to hear from you. 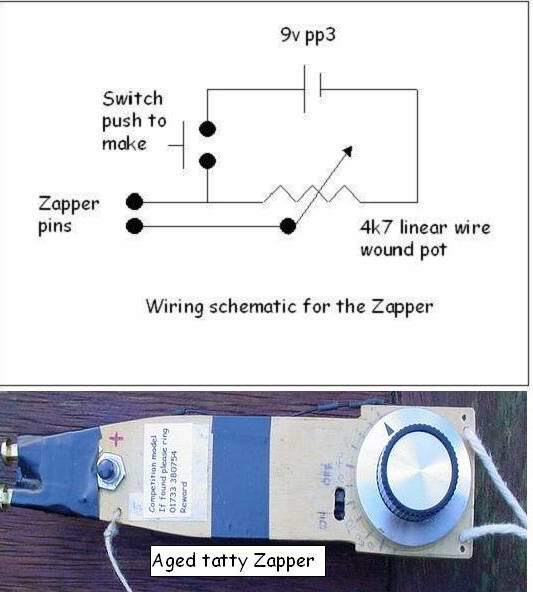 In April 2011, I received an email from Dave Andreski who had made a Peterborough FET timer and Zapper from notes in the Peterborough website 'Technical Articles/A Simple FET Timer for brushed 7/8mm pager motors'. 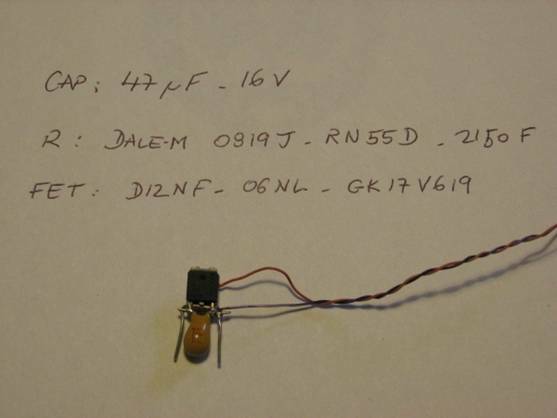 Dave did not have much trouble in finding the necessary components in the US and used the recommended STD12NF06L FET. A bare timer came out at 0.64gm and 0.94gm with wires. He included some photographs of his endeavours, together with an outdoor FF model, The Truant, weighing in at 33 gm ready to fly. He made a very nice job of his Zapper. I must rebuild mine someday. He did not say what motor he was using but it might be a DD 12mm can motor. Good to know that writing projects up is of use to other modellers.